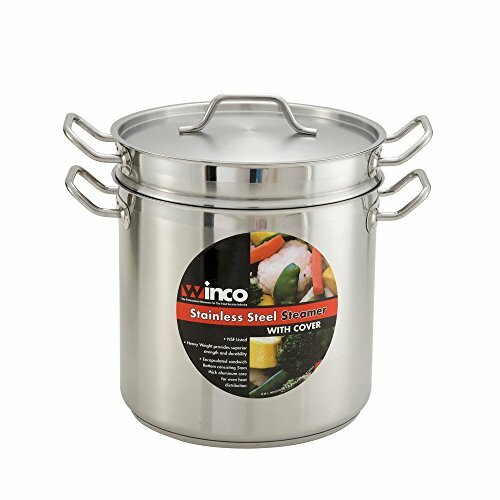 Winco SSDB-16S, 16-Quart 11" x 9-5/8" x 10-7/16" Commercial Grade Stainless Steel Steamer and Pasta Cooker With Cover, Double Boiler with Lid, NSF is an essential item for effortless cooking of seafood, delicate barbeque sauces, melting chocolate and more. This 16-quart steamer features a unique design that provides space between the bottom of the steamer and the pot to reduce the risk of spills and splashes while draining. The durable cover is included for preserving nutrients in your meal. The steamer and pasta cooker features three-ply bottom for even heating distribution. For an effortless, safe lifting, both the steamer and the inset are provided by two handgrips. Due to its stainless steel construction with a mirror polish, this item is not only attractive, but also extremely durable and reliable for an exceptional comfort in use. Moreover, the utensil is NSF approved. This professional double boiler with cover will be an extremely useful addition to your cookware collection that will help you to melt caramel and chocolate as well as cook delicate sauces and gravies. This 16-quart steamer features a unique design that provides space between the bottom of the steamer and the pot to reduce the risk of spills and splashes while draining. The double pasta cooker includes a pot for boiling water, an insert and a matching lid for better heat retention and circulation. Besides, this commercial grade double boiler is extremely useful solution for creating cream, cheesecake, custard, and a variety of other confections. For easy, secure transport, both the boiler and the inset have two handles each. NSF certified.